We’d love your help. Let us know what’s wrong with this preview of The Secret Servant by Daniel Silva. To ask other readers questions about The Secret Servant, please sign up. Yes HOW could you strand reading this? it was horrible!!! Lorraine Roy This was the worst book I have ever read in my lifetime.!! Haven't I already bought this ebook? Asteropê Why are you asking everyone this? Wouldn't you and only you know the answer to this question? Daniel Silva opens “The Secret Servant” with a first chapter that blisters a Europe that has mistaken capitulation to Islamic extremism as tolerance. It does not stop from there. This is the 7th book in Silva’s Gabriel Allon series and the first one to take on the use of rendition and the role Egypt has played in the geopolitics of the Middle East. The text takes a hard look at the issues in that region of the world. As always in Siva’s books both sides are allowed to air their grievance, but when a Jewish characters says to an devout Muslim “We’re the scapegoat for Arab failings”, and the Muslim character agrees you have to stop for a moment and consider the issues presented in the previous pages. This book was published in 2007 and yet it predicts with accuracy the so called “Arab Spring” that swept Egypt in 2011. The events Silva predicts actually happened, and just as he did in his novel “The Black Widow” (the first Allon novel I read, which inspired me to go back and read the series in order) Mr. Silva proves a prophet who has a keen insight into the pulse of the issues that he tackles in these books. Now don’t get me wrong, this is not a wonky policy series, these are espionage thrillers, and I read thru them at a rapid clip. You will keep turning the pages because Silva is a good writer and a good storyteller. A little dispiriting is the section after the climax where Silva depicts in a sadly realistic manner the way in which media attacks the good guys in the name of tolerance and thinly veiled anti-Semitism. If I did not see it actually happen in the real world I would dismiss it as fiction. But alas, I cannot. It feels nice to read a book where evil really does lose, and there is not incessant navel gazing by all of the characters. The methods used to fight the War on Terrorism are ugly. Silva does not deny it. Nor does he sit on the moral mountain and pass judgement on those who fight the war for us. He just presents it, you take it from there. Like other books in the series, the book contains enough history and historical fiction so that readers can pat themselves on the back for learning ... something ... about historical events and political/social/global issues and relations. (OK, let's not get carried away ... the author provides just enough history/context to make readers feel less guilty for getting sucked into a shoot-em-up mischief-and-mayhem scramble...) For folks who like their action/chase/drama reading sprinkled with travel, the series tends to cover a lot of ground, but this one bounces around more than most, containing enough frenetic border-hopping to satisfying those with serious armchair wanderlust.... The same disclaimers apply here consistent with the earlier books - these books aren't high literature, and they weren't written for pacifists, the squeamish (OK, the violence can get a tad graphic at times), and I wouldn't recommend them to anti-Semites (particularly Western European anti-Semites) or folks firmly opposed (or fundamentally unsympathetic) to the State of Israel or Israel's plight, right to exist, right to defend itself, etc. But that should be obvious, right? Of course, I'm NOT recommending that anyone start here - I've enjoyed the series (so far) in order, and there are a number of (highly) significant aspects of the story-line that build upon prior books. Sure, in any series, the number of characters ebbs and flows, and you can get by without the cumulative background or pre-requisites, but my sense is that I wouldn't have appreciated a number of the sub-plots in this one if I hadn't previously consumer the prior books. Another great espionage novel by the legendary Daniel Silva, revolving the even more legendary character he'd created, Mossad agent Gabriel Allon! (I just LOVE this guy). I also appreciate Silva's standpoint in viewing and explaining to the readers the course of happenings in the middle east, and especially Israel. Can't wait to read more books in this series, which became one of my favorite reads. Daniel Silva writes this series about Gabriel Allon, a master art restorer and part- time Israeli intelligence agent. In this book Elizabeth Halton, the daughter of the American ambassador to England, is kidnapped. The story jumps around from Amsterdam to Germany to Denmark as he attempts to find and rescue Halton. The book is well written and researched. I enjoyed the fact that Silva provides information about Islam, the Middle Eastern Politics and about being Jewish. The author attempts to pres Daniel Silva writes this series about Gabriel Allon, a master art restorer and part- time Israeli intelligence agent. In this book Elizabeth Halton, the daughter of the American ambassador to England, is kidnapped. The story jumps around from Amsterdam to Germany to Denmark as he attempts to find and rescue Halton. The book is well written and researched. I enjoyed the fact that Silva provides information about Islam, the Middle Eastern Politics and about being Jewish. The author attempts to present both sides of the issue involved without condoning terrorism. The book is extremely readable and an exciting spy novel. I read this as a paperback published by Signet in 2008. It is 500 pages. This new episode of the thrilling and terrifying life of Gabriel Allon completely pleased me: there was not only the excellent writing and the thrilling rhythm, but also true, solid feeling, good values such as loyalty and generosity, and the scope of the action was even more wide spread than in previous books. Gabriel lives in the permanent contradiction of being, at the same time, a killer and a saviour of sorts, always ready to give his own life, but to escape narrowly after a lot of persecut This new episode of the thrilling and terrifying life of Gabriel Allon completely pleased me: there was not only the excellent writing and the thrilling rhythm, but also true, solid feeling, good values such as loyalty and generosity, and the scope of the action was even more wide spread than in previous books. Gabriel lives in the permanent contradiction of being, at the same time, a killer and a saviour of sorts, always ready to give his own life, but to escape narrowly after a lot of persecution. Excellent book! My first Daniel Silva read was Portrait of a Spy. Enjoyed it so much, I couldn't wait to get into this one. The Secret Servant goes back a few years in the career of Gabriel Allon, Silva's art-restoring spy (what a combination!). I also noted that this work won the Publishers' Weekly Best Book of the Year award when it came out. In terms of word craft, The Secret Servant did not disappoint. Silva has a command of the language that can, at its best, enthrall. But by the time I got about halfway int My first Daniel Silva read was Portrait of a Spy. Enjoyed it so much, I couldn't wait to get into this one. The Secret Servant goes back a few years in the career of Gabriel Allon, Silva's art-restoring spy (what a combination!). I also noted that this work won the Publishers' Weekly Best Book of the Year award when it came out. But by the time I got about halfway into this book, the cumulative effect of Silva's pro-Israel bias was too much by at least half. Look, I've got no chip on my shoulder against Israel. But after the second book in a row that casts Israeli intelligence as so infinitely superior to its Western counterparts--when it pictures European agencies as so inept they have to step aside to let Israeli agents slap down terrorists on European soil--I think the point is reached when propaganda smothers even well-written prose and I begin to feel used. Recommends it for: Espionage fans, as usual! I don't know what number this is in the Gabriel Allon series (I think the 9th? ), but like all the other books Daniel Silva writes it contains a great deal of information about Middle Eastern politics and the U.S / England's relationships with countries like Israel and Saudi Arabia. Though Jewish himself, Silva writes with the knowledge that certain political alignments will never garner the outcome desired in the region: PEACE. For any of you looking to learn more, and to read fantastic spy novel I don't know what number this is in the Gabriel Allon series (I think the 9th? ), but like all the other books Daniel Silva writes it contains a great deal of information about Middle Eastern politics and the U.S / England's relationships with countries like Israel and Saudi Arabia. Though Jewish himself, Silva writes with the knowledge that certain political alignments will never garner the outcome desired in the region: PEACE. For any of you looking to learn more, and to read fantastic spy novels written by a former international correspondent, I highly recommend starting with book #1 and reading them all the way through! Second read for this one. Every bit as good the second time through as it was the first. I pulled The Secret Servant out of the bargain bin of my local bookshop some months ago because it ticked all the boxes: Israeli spy story set in Amsterdam and London. It was downhill from there. Daniel Silva’s weakness is a tendency to be didactic. That need to over-explain becomes problematic when it results in such gems as the “Zuiderkirk church”, which even spelled correctly translates as “South church church”, or “mackintosh raincoat”, which is a “raincoat raincoat”. The history and politics I pulled The Secret Servant out of the bargain bin of my local bookshop some months ago because it ticked all the boxes: Israeli spy story set in Amsterdam and London. It was downhill from there. The history and politics are bizarre, and master field operative, Gabriel Allon, makes errors a security guard would avoid. After fifty pages I stopped noting the errors. There were too many. I'm addicted to Gabriel Allon... A hot, greying spy whose cover is as an uber-successful art restorer? How can I not? For someone with an odd affinity for spy novels and a deep love of Renaissance art, this charcter is quintessential. This is not Silva's best book, but he has managed not to disappoint in the often-difficult task of developing his characters, "growing" them so to speak, as the series continues. I cannot wait for the next one! I took a break from Silva's series and now I've back to it still pleased with the way the hero is not a superhuman and bad things happen to him. In fact, bad things happen to everyone which means that as a reader, even though this is a series, I'm not really sure if the kidnap victim gets saved. Silva's protagonist is a government secret ops worker for Israel. Even so, Silva presents both sides of the very difficult conflict that exist between the Israeli and Arab worlds. What he doesn't forget, I took a break from Silva's series and now I've back to it still pleased with the way the hero is not a superhuman and bad things happen to him. In fact, bad things happen to everyone which means that as a reader, even though this is a series, I'm not really sure if the kidnap victim gets saved. Silva's protagonist is a government secret ops worker for Israel. Even so, Silva presents both sides of the very difficult conflict that exist between the Israeli and Arab worlds. What he doesn't forget, and I don't think we should either, is the fact that terrorism can never be condoned as a way to right wrongs. He also presents some very troubling statistics and prognoses if you listen (or read), the notes at the end of the book. These are based on current studies. Another great book with Gabriel Allon, my favorite spy/art restorer. The theme of this book is very contemporary since it deals with terrorism and how terror groups recruit their members. Incidentally, I have read this series out of order and I enjoyed it anyways. The best gets better-another great adventure in Gabriel Allon series. Elizabeth Halton, daughter of the American ambassador, has been kidnapped by terrorists who called themselves sword of Allah. Their demand to release a prisoner in exchange for Elizabeth life. Gabriel Allon hurls himself into a desperate search for this missing woman. Gripping with a lot of action and twist. The Secret Servant is a highly readable, well-constructed international spy thriller. Although it was published in 2007, the book's subject is radical Islamic terrorism in Europe, so it retains a "ripped from the headlines" feel in 2013. The writing is crisp and precise; the plotting is expertly crafted. The story is somewhat complicated, but never overly so, as the author handles its twists and turns smoothly. The pacing is consistently taut, and the suspense never lets up. 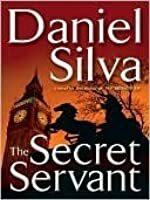 Daniel Silva frames t The Secret Servant is a highly readable, well-constructed international spy thriller. Although it was published in 2007, the book's subject is radical Islamic terrorism in Europe, so it retains a "ripped from the headlines" feel in 2013. The writing is crisp and precise; the plotting is expertly crafted. The story is somewhat complicated, but never overly so, as the author handles its twists and turns smoothly. The pacing is consistently taut, and the suspense never lets up. Daniel Silva frames the tale unambiguously as one of good vs. evil. Evil is represented by mostly Egyptian Islamic radical jihadists living and operating in northern European capitals and bent on mass slaughter. Good is represented by the Israeli foreign intelligence service, and specifically its renowned superspy, Gabriel Allon. This is the seventh novel in Silva's Gabriel Allon series. In addition to being a widely revered member of the Israeli spy service (according to the back story, Allon's reputation was established in a successful mission to avenge the killings of the Israeli athletes in the 1972 Munich Olympics), Allon is also one of the world's finest restorers of Italian Renaissance art. He's typically at work in a cathedral in Venice or Rome when he's called back to "the Office" on King Saul Boulevard in Tel Aviv to begin another mission. The first three novels in the series in my view set a standard that hasn't been matched in the more recent books. Their plots dealt creatively with fascinating aspects of the long aftermath of the Holocaust: old Nazis who have escaped prosecution, the current status of property (notably paintings) that had been looted from Jewish victims of the Holocaust, etc. Subsequent books have had more topical 21st-century plots, often, as here, involving the "war on terror". While I enjoyed this book and found it absorbing and thought-provoking, it had some notable weaknesses. First, Allon's motivation in this tale is unclear, and it seems illogical. He willingly and repeatedly risks his life in attempts to save the life of a person he has never met; her welfare is to Allon a bigger priority than protecting or saving the lives of large numbers of other potential terrorist victims. This plot device may be an attempt to personalize and humanize Allon's motivation, but Silva doesn't take the reader inside Allon's thought processes, so it was never clear to me why Allon cares so inordinately about this one individual potential terrorist victim. This has got to be one of Daniel Silva's best in the Gabriel Allon series. Although well written,the predictable plot somewhat smacks of a potboiler. However, the expected conclusion of this story is overridden just by the excitement of getting there. What makes this story stand out is its presently still timeliness in reference to the Islamic Jihad problem. Interspersed among numerous fast-paced short chapters are statements like "The Americans threw in their lot with the secular dictatorships of the Middle East a long time ago, and now the oppressed are rising up and taking their revenge on symbols of American power." And in trenchant reference to the justification of torture you read,"But then we've all crossed a line. The Americans crossed a line after 9/11, and now they're trying to find their way back to the other side. Unfortunately, the goals of the terrorists haven't changed -- and the generation soon to emerge from the killing fields of Iraq is going to be much more violent and volatile than the ones who came out of Afghanistan." "We dare to fight back, and the terrorists accuse us of being the real terrorists." I'm working my way through the Gabriel Allon series. This is the 7th in the series and it feels very repetitive and formulaic, like a mash up of previous books. Once again we start with Gabriel Allon being sent to Europe to clean up after the death of an Israeli source. Once again he is identified almost immediately because he's possibly the most inept agent ever. Then it merges into a kidnap plot with elements of The Messenger and Allon proves useless at i) hostage negotiation and ii) rescue, b I'm working my way through the Gabriel Allon series. This is the 7th in the series and it feels very repetitive and formulaic, like a mash up of previous books. Once again we start with Gabriel Allon being sent to Europe to clean up after the death of an Israeli source. Once again he is identified almost immediately because he's possibly the most inept agent ever. Then it merges into a kidnap plot with elements of The Messenger and Allon proves useless at i) hostage negotiation and ii) rescue, but somehow emerges wth his reputation more enhanced than ever. The ending drags on and is underwhelming. The book is also let down by the leaden dialogue - people speaking in explanations, saying things like: "you mean the covenant that forbids you from operating on European soil without first obtaining permission from the security service of the country involved" or "Islamic extremism is just the latest virus to thrive in Europe's nurturing environment" - people don't talk like that! On the plus side, the pace is good, it feels topical and has a great sense of location. É o 7º livro da série Allon e mais uma vez não desiludiu, apesar de existirem algumas diferenças em relação aos anteriores, como por exemplo o tema "arte" ter menos destaque, mas afinal, não nos podemos esquecer que Allon deixou de assumir o papel do restaurador de quadros. Allon depara-se novamente com terrorristas e que o levam a viajar pela Europa, para tentar encontrar a filha do embaixador americano que foi raptada. Allon vê-se a braços com um resgate que acabará no dia de Natal, em que porá É o 7º livro da série Allon e mais uma vez não desiludiu, apesar de existirem algumas diferenças em relação aos anteriores, como por exemplo o tema "arte" ter menos destaque, mas afinal, não nos podemos esquecer que Allon deixou de assumir o papel do restaurador de quadros. Allon vê-se a braços com um resgate que acabará no dia de Natal, em que porá em risco a sua própria vida, bem como a de muitas pessoas inocentes. Os livros com Allon têm sempre como pano de fundo a guerra entre Israel e Palestina, e desta feita sobre o fanatismo religioso que se vive desde o atentado de 2001. Silva is the only one of this genre that I read and I love them. Silva and Christopher Buckley's Florance of Arabia are my main instructors on the Middle East today. But this one was not my favorite. Dialogue was annoyingly cliched. Why does Silva always make the super Jewish spy rescue some well bred shiksa? Also found him more dogmatic than ever before. Can't deny it was a page-turner! After this, need something more edifying. The Secret Servant by Daniel Silva begins with a dead Jewish scholar, as Gabriel Allon books often do. Professor Solomon Rosner is “the first asset in the annals of Office history to have proven more useful to them dead than alive.” He is killed in Amsterdam in a normally a peaceful neighborhood. Rosner runs the Center for European Security Studies. “[T]he center had managed to produce a steady stream of authoritative reports and articles detailing the threat posed to the Netherlands by the rise The Secret Servant by Daniel Silva begins with a dead Jewish scholar, as Gabriel Allon books often do. Professor Solomon Rosner is “the first asset in the annals of Office history to have proven more useful to them dead than alive.” He is killed in Amsterdam in a normally a peaceful neighborhood. Rosner runs the Center for European Security Studies. “[T]he center had managed to produce a steady stream of authoritative reports and articles detailing the threat posed to the Netherlands by the rise of militant Islam within its borders.” Rosner had a lot of enemies both Islamic and Dutch. He is killed on the way to lunch by one of the painters who has been working across the street from his office. Obviously painting is not the man’s only job. Shamron reveals that Rosner also worked for the Office. Rosner was to keep eyes and ears on Islamic extremism to give some early warning of possible terrorist targets. Rosen helped them stop and assassinate the members of an al-Qaeda affiliated “cell operating in West Amsterdam [when they] got their hands on a missile and were planning to shoot down an El Al jetliner." The painter who killed Rosen was named Mohammed Hamza and there was a videotape found in his apartment. Gabriel is to go get all of Rosen’s files which ends up being about 500,000 documents. Rosen started out as a sayan. “[S]ayanim are a worldwide network of volunteer Jewish helpers, Bankers are used to provide cash for Office agents, doctors treated them in secret, hoteliers gave rooms under false names, rental car employees gave them untraceable vehicles. Then Shamron recruited him. Gabriel is given an assistant, Eli Lavon. He is described as small and bookish, with wispy unkempt hair and quick brown eyes – As usual he seems to be wearing all his clothes at once. And he is “the finest street surveillance artist the Office has ever produced.” He is an archeologist by training and has also been an ayin or tracker. Este volume foi o que mais me custou a ler, eram vários serviços secretos (EUA, Britânico, Egípcio, Dinamarca) e os nomes árabes difíceis de fixar, e diversas localidades. Mas não deixou de ser interessante, muito bem estruturado e explicito, e ao mesmo tempo extremamente assustador que nos faz pensar no que pode acontecer na Europa. Ficamos a entender melhor e a saber porque é que os jihadistas matam pessoas inocentes ou são suicidas. Julgam que estão a fazer bem e que vão para céu. A melhor pa Este volume foi o que mais me custou a ler, eram vários serviços secretos (EUA, Britânico, Egípcio, Dinamarca) e os nomes árabes difíceis de fixar, e diversas localidades. Mas não deixou de ser interessante, muito bem estruturado e explicito, e ao mesmo tempo extremamente assustador que nos faz pensar no que pode acontecer na Europa. Ficamos a entender melhor e a saber porque é que os jihadistas matam pessoas inocentes ou são suicidas. Julgam que estão a fazer bem e que vão para céu. I am now obsessed with this series. They get better and better. I don't go in depth about the plots because so many reviewers do that for me. Love how you almost feel like you know the characters in real life! This book really did not live up to previous books in the series. Story seemed to follow exactly the same lines as prior books, and included quite a bit of "preaching" against terrorist activities. Narrator was excellent, but all in all I was disappointed in the book. Another riveting installment featuring one of my favourite characters, the illustrious Gabriel Allon. As always, a fast-paced edge-of-your-seat political thriller. What can I say about this series which I have not said earlier? This is book 7 and the writer manages to weave one engrossing tale after another. Secret Servant is a page turner which keeps you on the edge till the last page. Nao me considerando grande fã do Daniel Silva nao deixo de gostar de alguns dos seus livros. Gostei bastante deste, talvez porque a componente de espionagem é bem menor. This one fell flat for me. Not all that exciting and rather predictable. "גבריאל לקח מידי נבות את הספר. ספר מתח קליל שאמור להיות טוב, חשב. נשמע נחמד, אבל הדברים האלה איכשהו אף פעם לא מסתדרים ככה..."
וזה באמת לא הסתדר. זה בהחלט ספר טוב ומהנה, שמכניס אותך אליו ואתה מוצא את עצמך עם קושי להפסיק לקרוא לפעמים. אבל, עלילה לא כל כך מפתיעה(מה שמפתיע זה מאיפה כל החומר נפץ הזה הגיע? נראה לי כיוון טוב לנסות להבין מאיפה זה הגיע, כי יש שם לא מעט חומרי נפץ), בהחלט מעלה כמה וכמה שאלות בנוגע ל"לאירופה המוסלמית" והתרחיש המתואר בהחלט לא עד כדי כך מופרך. אבל... בספר מתואר פיגוע בלונדון ו "גבריאל לקח מידי נבות את הספר. ספר מתח קליל שאמור להיות טוב, חשב. נשמע נחמד, אבל הדברים האלה איכשהו אף פעם לא מסתדרים ככה..."
וזה באמת לא הסתדר. זה בהחלט ספר טוב ומהנה, שמכניס אותך אליו ואתה מוצא את עצמך עם קושי להפסיק לקרוא לפעמים. אבל, עלילה לא כל כך מפתיעה(מה שמפתיע זה מאיפה כל החומר נפץ הזה הגיע? נראה לי כיוון טוב לנסות להבין מאיפה זה הגיע, כי יש שם לא מעט חומרי נפץ), בהחלט מעלה כמה וכמה שאלות בנוגע ל"לאירופה המוסלמית" והתרחיש המתואר בהחלט לא עד כדי כך מופרך. אבל... בספר מתואר פיגוע בלונדון וחטיפה של צעירה אמריקנית. דניאל סילבה מכניס בכוח את הגיבור הישראלי שלו לעלילה, ושמים לב שזה מאולץ. "אחד מסופרי הריגול המחוננים באמריקה", ו"יורשם של גרהם גרין וג´ון לה קארה". כשכתוב "מחבר ספרות הריגול הטוב בדורו" אתה מצפה לספר מעולה וכשכתוב "היורש של ג'ון לה-קארה", אולם ראיתי רק את הסרט של החפרפרת שעשו ב-2011(גרי אולדמן, קולין פירת' ובנדיקט קאמבר-משהו). אתה מצפה לספר עם עלילה מורכבת. זה לא שלא היו שם תחבולות של הרעים והטובים("בתחבולות תעשה לך מלחמה - זאת התורה שלנו"). אבל, בהחלט ציפיתי למשהו יותר "מורכב". עולם הריגול של סילבה נשמע דומה יותר לג'יימס בונד מאשר של ג'ון לה-קארה. זה אכזב. למרות שהספר הוא מהנה לגמרי. זהו גם הספר הראשון שאני קורא של סילבה. האם אחפש עוד ממנו? התשובה הקצרה היא כן. התשובה הארוכה היא שיש לי ספרים ברשימת קריאה שלפי דעתי עדיף שאבזבז את זמני עליהם מאשר עוד סילבה כרגע. אין לי שמץ איך הוא קיבל בGOODREADS ציון של 4.23, כי לפי דעתי הוא בין 3.8 ל-4.05. לסיום, שאלה שעלתה לי לראש, האם סופר לא ישראלי שממה שהבנתי לא היה בישראל יכול לכתוב על סוכן מוסד? בתשובה הקצרה, כן. NOTE: This review was written based on the Audio CD version. 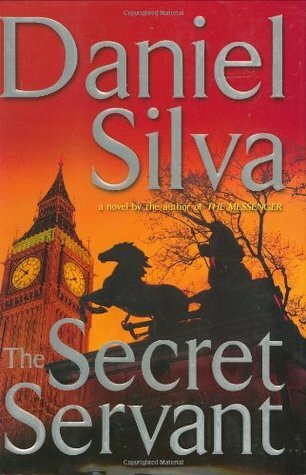 Daniel Silva's "The Secret Servant" is the best "Book on Tape" that I have listened to in awhile. There have been times when I almost wish that my commute was longer or that we'd had some heavier traffic just so I could listen to more of the book each day! Credit begins with Silva's novel - the pacing was fantastic. The mix between action and pauses, the characters & dialog, the overall plot were quite well done. I'll never know (no NOTE: This review was written based on the Audio CD version. Credit begins with Silva's novel - the pacing was fantastic. The mix between action and pauses, the characters & dialog, the overall plot were quite well done. I'll never know (not without reading the original work) if Phil Gigante's narration is driven by his text, or if the novel is enhanced by his verbalization. Daniel Silva was born in Michigan in 1960 and raised in California where he received his BA from Fresno State. Silva began his writing career as a journalist for United Press International (UPI), traveling in the Middle East and covering the Iran-Iraq war, terrorism and political conflicts. From UPI he moved to CNN, where he eventually became executive producer of its Washington-based public polic Daniel Silva was born in Michigan in 1960 and raised in California where he received his BA from Fresno State. Silva began his writing career as a journalist for United Press International (UPI), traveling in the Middle East and covering the Iran-Iraq war, terrorism and political conflicts. From UPI he moved to CNN, where he eventually became executive producer of its Washington-based public policy programming. In 1994 he began work on his first novel, The Unlikely Spy, a surprise best seller that won critical acclaim. He turned to writing full time in 1997 and all of his books have been New York Times/national best sellers, translated into 25 languages and published across Europe and the world. He lives in Washington, D.C.